The authors suggest a new technique for improvement of recognition reliability. The procedure is based on analysis of an image at several degrees of detail produced in the course of discrete wavelet transformation of the image. The results are presented by efficiency analysis of the algorithm for recognition of images by their distinctive points. PLEKIN, V.Ya. ; KREVETSKIJ, A.V. "Detection of group point objects with known shape of an associated continuous image," Izv. VUZ. Radioelektronika, v.35, n.4, p.66-73, 1992. ASTAF'EVA, N.M. "Wavelet analysis: basic theory and some applications," Physics-Uspekhi, v.39, p.1085, 1996. DOI: https://doi.org/10.1070/PU1996v039n11ABEH000177. 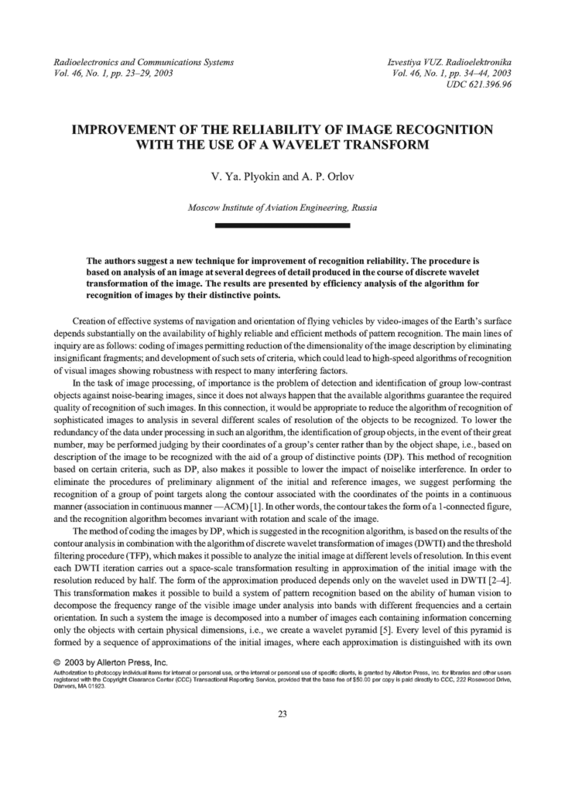 MALLAT, S.G. "Multifrequency channel decompositions of images and wavelet models," IEEE Trans. Acoustics, Speech, Signal Processing, v.37, n.12, p.2091-2110, 1989. DOI: https://doi.org/10.1109/29.45554. DAUBECHIES, I. "Ten Lectures on Wavelets," CBMS 61, Series of Applied Mathematics, Philadelphia PA, SIAM Pr., 1992. HARATISHVILI, N.G. ; CHKHEIDZE, I.M. ; RONSEN, D.; INDJIYA, F.I. The pyramidal Coding of Images [in Russian]. Moscow: Radio i Svyaz’, 1996.